Having not seen the previous three Insidious films, I intentionally avoided watching them before seeing the franchise's fourth installment, Insidious: The Last Key, to see if it managed to hold up on its own. Surprisingly, the answer is yes, which is all the more shocking considering that the film was released in January, usually a dumping ground for substandard horror product that the studios would rather bury. Set in 2010, just before the events of the first film, The Last Key focuses on Lin Shaye's paranormal investigator, Elise Rainier, previously a supporting character but now elevated to lead role. Rainier is called in to investigate yet another haunting, this time in her childhood house (she refuses to call it a home), where she first learned she had psychic abilities. Returning to the place where it all began forces her to confront her past, her abusive father's painful impact on her life, and the demon that has tormented her family for nearly 60 years. The most striking thing about The Last Key is its use of silence. Director Adam Robitel, whose only previous directing credit is a little-seen found footage horror film from 2014 called The Taking of Deborah Logan, displays a keen understanding for what scares people. The film does rely on jump scares, as so many other modern horror films do, but they seem to flow naturally from the story. These aren't the usual fake-outs accompanied by stabs of music on the soundtrack. They almost always come out of complete silence at moments when they are least expected. The prevalence of silence, free of unnecessary sound design or electronic bass rumbling designed to create artificial suspense, gives the film a consistently unnerving atmosphere, so that when the scares do come, they feel earned, offering a much needed break in the tension. It's a bold move for a mainstream horror film, but it pays off. Where the film falters, however, is in Leigh Whannell's screenplay, which relies far too heavily on awkward comic relief courtesy of Rainier's two bumbling assistants, Specks (Whannell) and Tucker (Angus Sampson), who spend much of the movie creepily leering at Ranier's young nieces. Those scenes stand in such stark contrast to the rest of the film, and that their gross advances ultimately pay off feels incongruous to the #MeToo consciousness of 2018. When it's focused on the spooky stuff, however, the film mostly works. The prominent presence of locations and characters in the film's advertising that are nowhere to be found in the finished product betray heavy post-production tinkering, but one can't help but wonder if it isn't for the better. Robitel seems to understand that the scariest things are in our imaginations, and he lets the audience fill in the blanks ourselves for most of the running time, cleverly playing on childhood fears of dark rooms and things that go bump in the night. But by the time all the ghosts come out to play for the film's climax, it all feels like a bit of a letdown, ending with a whimper rather than a bang, before directly leading into the events of the original Insidious. The good news is that one need have no prior connection to these characters to feel for them, and the fact that a major Hollywood franchise is putting a woman in her 70s front and center is pretty remarkable. Shaye makes for a compelling heroine, refusing to be a victim and taking charge where men frequently fail, and her grounded and performance gives the film an emotional center. The Last Key is as much about confronting inner demons as real ones, coming to terms with a painful past in order to create a better future. Unfortunately, the real demons turn out to be less interesting than the figurative ones, and as they take center stage in the film's third act it loses much of its steam. Here, evil feeds off hate and can only be defeated with love, which is a nice sentiment but one that doesn't quite get the spotlight it deserves, leading to an emotional coda that doesn't quite feel earned. Nevertheless, it's much than a January horror film really ought to be (especially as the fourth film in an eight year old franchise), which makes it something of a pleasant surprise. Robitel shows great promise as a filmmaker, and with a stronger script could potentially become a real force to be reckoned with. 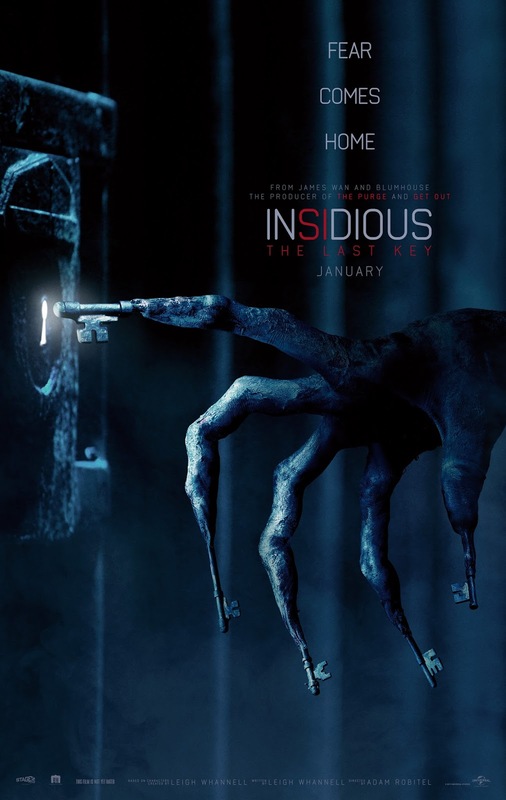 INSIDIOUS: THE LAST KEY | Directed by Adam Robitel | Stars Lin Shaye, Angus Sampson, Leigh Whannell, Josh Stewart, Caitlin Gerard, Spencer Locke, Tessa Ferrer | Rated PG-13 for disturbing thematic content, violence and terror, and brief strong language | Now playing in theaters everywhere.